This is one of my favorite Connecticut history books and I collect and sell both the books and the 190 engravings which are contained in damaged volumes. The contents of these great volumes includes every town in Connecticut. 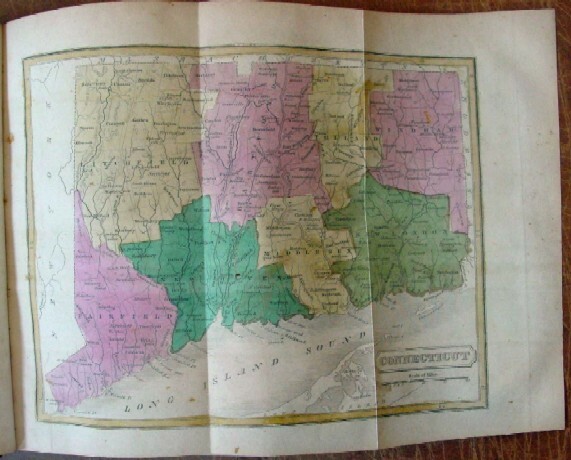 The 1838 edition book offered here is full leather, recently re-backed, with the hand-colored map in nice condition and not badly foxed (brown spots as shown above) for its age. On the Connecticut index page and below you can see examples of the wood engravings of Connecticut towns contained in the volume. If you are interested in an engraving of your town send me an email and I will tell you what we have. 170 year old volumes in nice condition are rare and this is one of the nice ones I have seen. From His "Connecticut Historical Collections"
We can mat and frame any of the engravings, we have one of our town in the living room (shown below). The full page engravings of Hartford, Bridgeport, New Haven, Litchfield, Norwich, New London and Middletown are about 8 x 5 inches and the other engravings are about half that size. Contact us for availability and price (matted and/or framed) by emailing us at info at historygallery dot com or calling us at 860 429-6927.